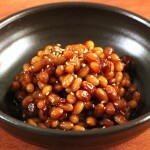 Kongjang (or kongjorim) is made with dried soybeans and Koreans eat it as a side dish for any meal. It’s sweet, chewy and sticky. Rinse the soy beans in cold running water. Drain and put them in a pan. Add 2 cups of water to the pan and soak the beans for 8 hours. Cover and boil the mixture of beans and water over medium high heat for 10 minutes. If it boils over, crack the lid. Add soy sauce, sugar, vegetable oil, and garlic. Stir a few times with a wooden spoon. Reduce the heat to low, cover, and cook for 30 minutes. Open the lid and turn up the heat to medium high heat, stirring with with wooden spoon until the beans turn shiny and a little wrinkly. Remove from the heat and sprinkle with the sesame seeds. Let cool and transfer to an airtight container. Refrigerate up to 1 month. Posted on Thursday, February 14th, 2008 at 8:38 am. Last updated on January 8, 2019. Posted February 7th, 2019 at 7:25 pm | Log in to reply. Posted April 2nd, 2018 at 12:32 pm | Log in to reply. Hello!!!! I was wondering if I could do a quick boil soak on the beans verses waiting hours for the beans to soak? Posted December 16th, 2017 at 6:55 pm | Log in to reply. Hello Maangchi! My husband is Korean and I’ve been using your recipes for the past three years. 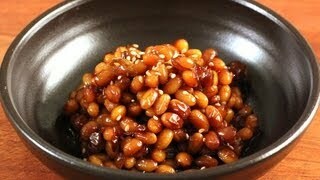 I really love this soy bean side dish! I cook it very often (in the process of cooking it now actually) :). Just wanted to point out that the proportions you have in the video and the ones you described in the written recipe are a bit different – in the video you use 1/2 cup of sugar, but the written recipe indicates as 1/3 cup. As well as very important step (at least for my oven) in the video you leave soy beans for 30 min at the low heat, but in the recipe you described to leave them at the medium heat. Once I cooked this side dish following your written recipe, and it totally failed :( because of the medium heat the beans completely burned out. Posted December 16th, 2017 at 9:48 pm | Log in to reply. Posted January 17th, 2017 at 8:29 pm | Log in to reply. I went grocery shopping this weekend and I was looking for black beans to cook with my rice. However, I was surprised to find more than one variety of black bean. One is called (phonetically) “Seorittae” and the other was Black Beans, phonetically “Kam-man Kong”. Do you know the difference between the two and which is used to cook with rice? Posted January 19th, 2017 at 11:24 am | Log in to reply. Seoritae (서리태) is a kind of black bean, and inside, right beneath the black skin is green. The bean is larger than usual black beans and is known as a great resource of protein and a variety of minerals. It’s more expensive than usual black beans (검은콩). You can add to rice and also make a side dish((kongjorim) with it or add to rice cake. Posted July 13th, 2016 at 4:55 pm | Log in to reply. How long does this keep in the refrigerator? Posted June 25th, 2016 at 2:06 pm | Log in to reply. Hi! I made this today but something seemed wrong… the result was salty and not too sweet or sticky… I’m not sure what I did wrong. When boiling on high heat, it never seemed to get sticky… i used the written instructions… I’ll try it again, thanks! Posted June 26th, 2016 at 6:16 am | Log in to reply. If it’s not sweet and not sticky enough for you, add more sugar or rice syrup. “When boiling on high heat, it never seemed to get sticky” Did you leave the lid off? Posted March 31st, 2016 at 12:55 pm | Log in to reply. Maangchi, thank you so much for this delicious recipe. I made it for a picnic yesterday. I loved how everyone just kept saying “Pass the kong please”. Do you know how happy it made me to share this dish with friends? Posted August 23rd, 2015 at 4:24 pm | Log in to reply. I made kongjang and it tastes really good but I was wondering if the beans should have been softer. I cooked them according to the recipe, which was also the instructions on the bag, but they’re really pretty firm. Any feedback on this? I’m used to cooked beans being soft. Posted August 24th, 2015 at 2:42 pm | Log in to reply. The hardness of the beans depends on the kind of bean, size, and dryness. So I suggest you soak the beans longer, maybe a few more hours. Posted June 6th, 2015 at 10:01 pm | Log in to reply. btw I came here today wondering how Korean people cook beans. Is there another delicious vegetarian bean dish that are not sweetened? Most Western bean dishes I know involves cooking them with olive oil and tomatoes (or bean burger) and I’m looking for variety! This recipe was originally posted on February 14, 2008 at 8:38 am by Maangchi. It was last updated on January 8, 2019. The video was watched 131,867 times on YouTube & has 798 likes!